The Stroganoff Palace, built in 1752, under the supervision of Italian architecture Francesco Bartolomeo Rastrelli, is a true masterpiece of Russian Baroque. 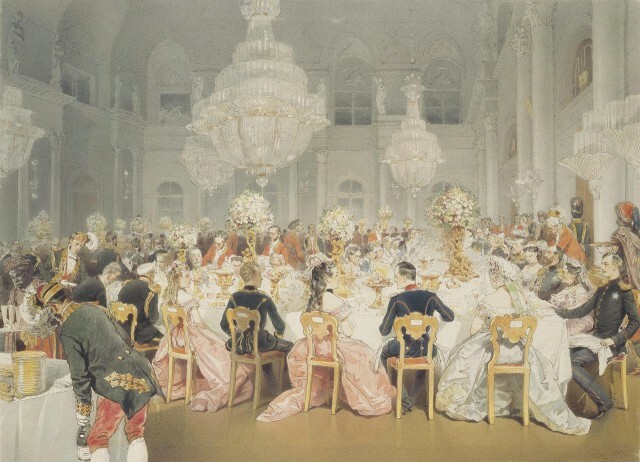 The Stroganoff Palace was a center of cultural life in imperial St. Petersburg. No wonder that Restaurant “Russian Ampir” is settled in this historical building and nowadays it carries on a tradition of Russian culture. Celebration that you will remember forever exclusivity, luxury and splendor inherent in a fashionable reception.It will be remembered forever you exclusivity, luxury and pomp, peculiar a fashionable reception. 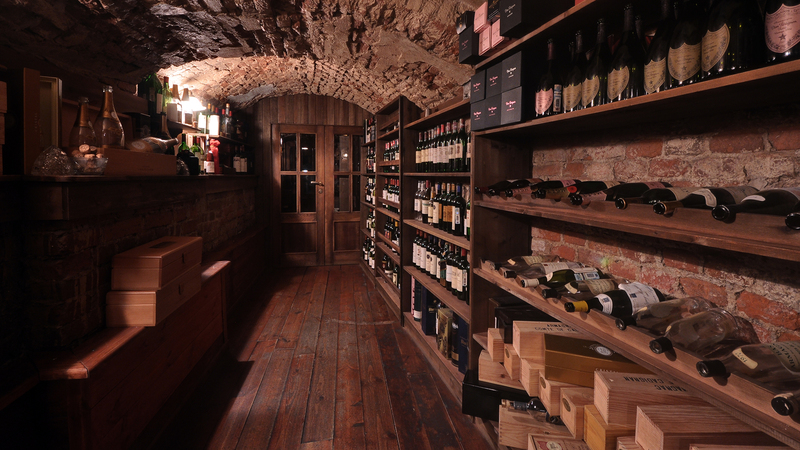 With the opening of the restaurant “Russian Ampir” the unique wine vaults were restored and given a new lease of life. These wine vaults are famous for the incredible wine collection that is considered to be the most luxuriant in the 21th century. Every guest has a great chance to spend an unforgettable night in the smallest palace hotel in the world. Apartment, as well as the restaurant, is stylized with interior of 18th century with modern facilities that meet all the standards of the 21th century. "Russian Empire" regularly offers a variety of dishes gala dinners, which can be enjoyed in the royal interiors of the restaurant. Often held here, and special events with the participation of art and culture. 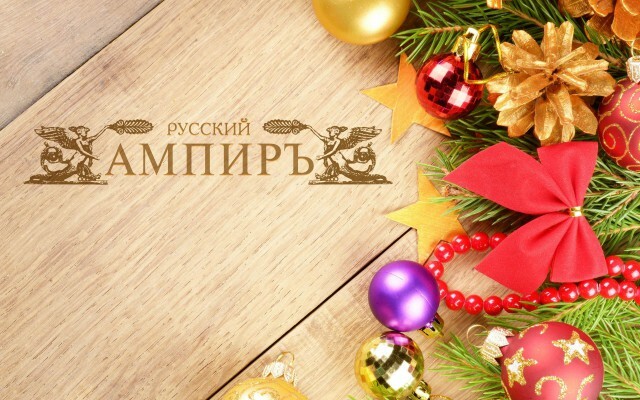 One of the oldest palaces of St. Petersburg and restaurant “Russian Empire” invites You to celebrate Christmas in unique atmosphere of 18th century. St Valentine’s Day in Russian Empire. 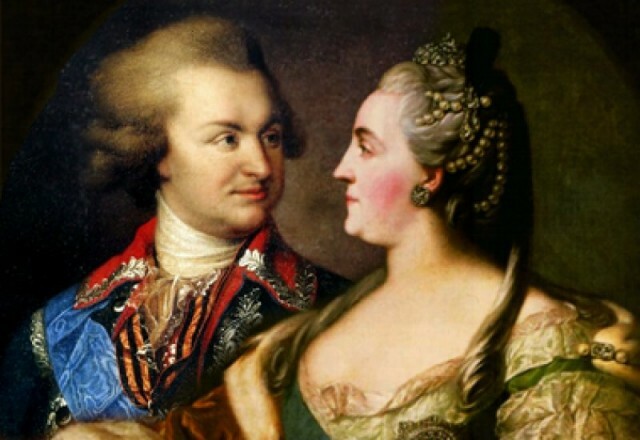 One of the oldest Palaces in St. Petersburg and restaurant Russian Empire invite you and your Valentine to celebrate your love in the unforgettable atmosphere of the 18th century. Refined interiors and romantic classical music will create the ideal atmosphere for most sincere and passionate confessions. 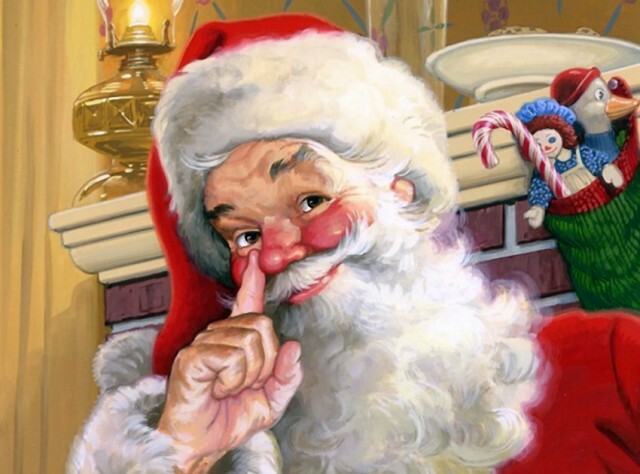 The end of December was marked by the opening of an art exhibition by Robert Ovakimyan. The series of paintings is called The Angels Bay and was inspired by picturesque views of Monaco. The sunny paintings convey the dazzling atmosphere and happiness of a hot summer so much longed for during gloomy Saint-Petersburg winter. 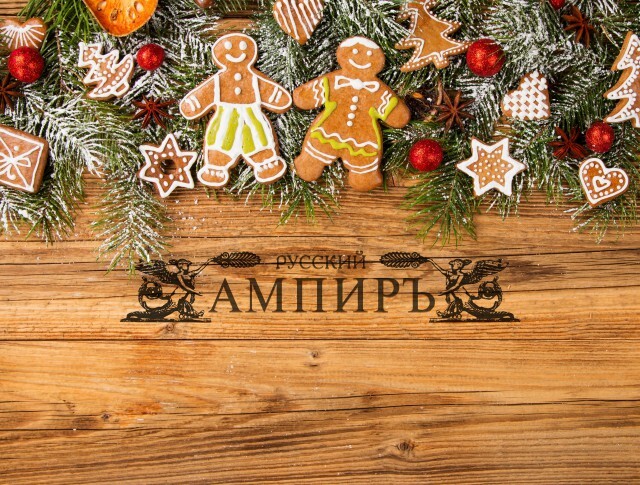 Restaurant-palace Russian Empire has prepared a special Christmas treat for you – a fabulous Christmas dinner that will be served from December 24, 2014 to January 15, 2015. One of the oldest Palaces in St. Petersburg and restaurant Russian Empire celebrated Christmas with a true imperial style and luxury. Why did we name the Restaurant “Russian Ampir”? Originally, Empire (in Russia “Ampir”) is the architectural style, it originated in and took its name from the rule of Napoleon I in the First French Empire, in the following, this architectural style was adopted and altered by Russian architects and got the name the Russian Empire. 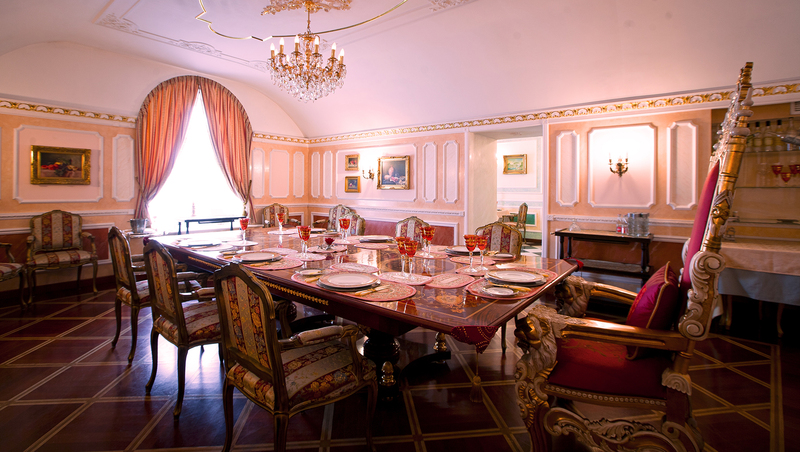 There are five gorgeously restored dining halls in the restaurant and palace “Russian Ampir”. 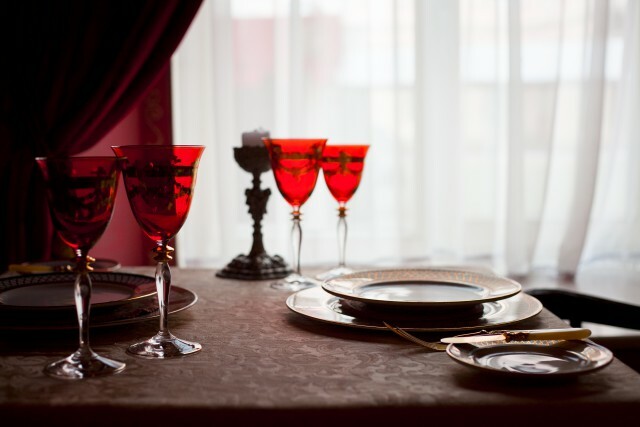 Even the most exacting audience will be fascinated by the view of tables served with 24 karat gold flatware, exclusive porcelain of 18th century, crystal wares encrusted with gold. A visit to restaurant "Russian Ampir" is a proper acquaintance with the cuisine of Russian aristocracy in the days of the imperial St. Petersburg. 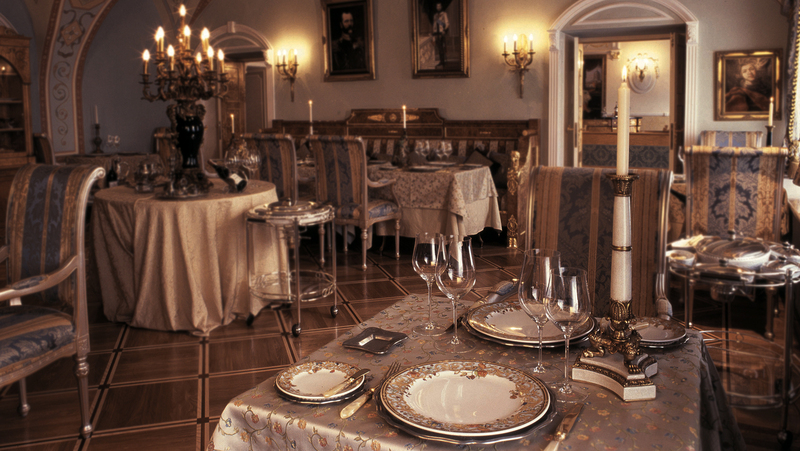 “Russian Ampir” cuisine rehearses the fancy of Imperial dinners by using gastronomic specialities. Many of recipes were recovered from the cookery book of the Imperial Winter Palace, among them were recipes of Stroganoff’s family. Restaurant “Russian Ampir”2015. All rights reserved.